How did I get here? I have no idea, but you should stay a while. There’s a lot of really neat stuff to check out. Can I copy one of your recipes on my own blog? Sure, just make sure you give me a little credit. How often do you post? Currently about once a week. Unfortunately the 9-5 gig cuts into the creative writing time, but my new years resolution will be 3x a week. Get ready! How can I advertise with you? There’s some great real estate on my page for advertising. 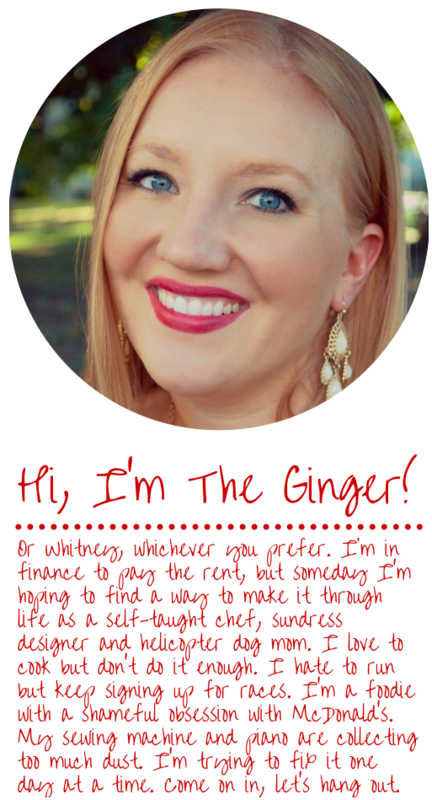 Email me at info@thenaturalginger.com and we can discuss pricing, or maybe some trading spaces if you have a blog too! Do you get stuff for free? Sometimes. I’ll tell you if I do. I still only share opinions that are mine. I’ve recently gone gluten free and I have a recipe or food I miss but you don’t have it in the archives. What am I supposed to do? Email me! I love a challenge. Unless it’s phyllo dough. Then you’re definitely out of luck. I’m open to trying to help you out on just about anything else. Is that your natural hair color? Yes. Anything I missed? I love mail! Email that is – if you send me regular mail it’s going to freak me out since I haven’t published my address. Drop me a line at info@thenaturalginger.com.